"Yet another opinion poll shows Australians’ love of solar and the existing Renewable Energy Target continues to be strong. "The latest Essential Poll shows 65% of Australians think the existing Renewable Energy Target is right, or should be increased. "Only 8% of Australians think the Renewable Energy Target should be lower. 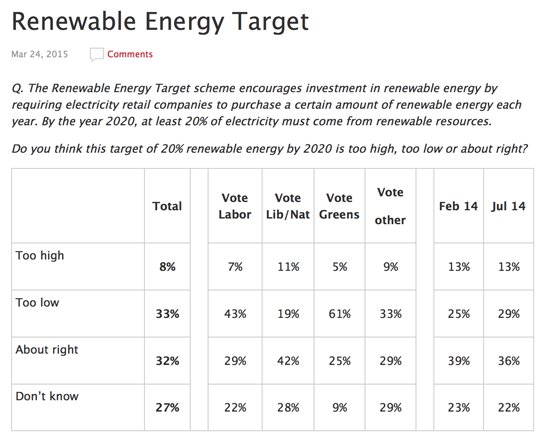 "Only 11% of Liberal/National Party voters think the RET should be lower. "When it comes to climate change, 45% of Australians support "incentives for renewable energy" as the best form of action on climate change. "That is more than three times the level of support for the next preferred action. "Even Crosby Textor, the chief pollsters for the Liberal Party, reported how much Australians love solar with an incredible 82% "favourable" towards solar panels. "The big power companies found only 17% favourable support. "We know Australians love solar. "We know Australians want more solar, not less. "And we know Australians want Governments to make it easier, not harder, for them to slash their power bills with solar. "That's why we are campaigning so hard to Save Solar and the Renewable Energy Target."